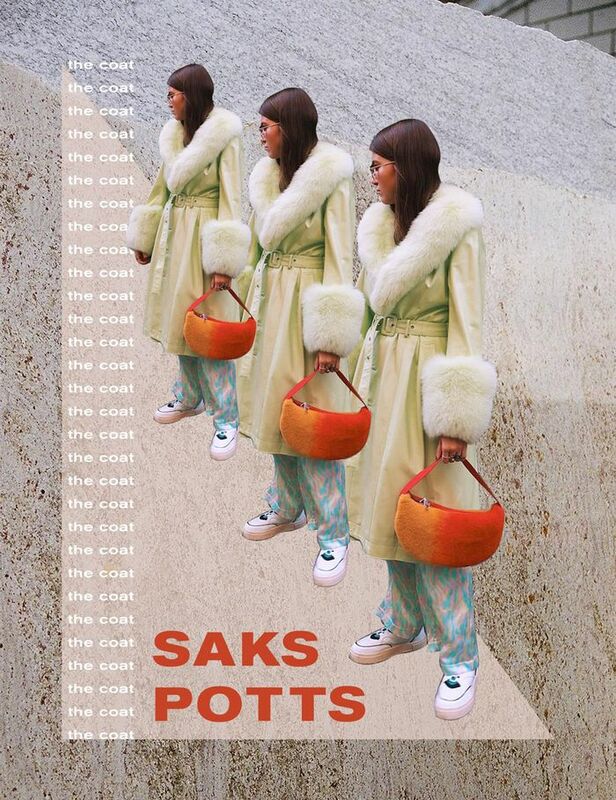 Thanks to Barbara Potts and Cathrine Saks, the masterminds behind cult Copenhagen-based brand Saks Potts, everything the duo puts out becomes an instant must-have. Their particularly whimsical vision has made them an industry favorite. Just ask any fashion girl what she's lusting after right now and chances are a pair of the brand's logo tights or its infamous fur-trimmed jacket are poised at the top of such a list. The latter piece, the brand's Foxy fur-trimmed coat, is without a doubt the It item of winter 2018/19. A long leather coat with a billowy fur collar, exaggerated fur cuffs, and belt at the waist, the silhouette is nothing if not statement-making. Log onto Instagram on any given day and you'd be hard-pressed not to come across one of the many candy-colored creations styled by fashion girls or worn by one of the brand's many celebrity fans like Kendall Jenner and Cardi B. The luxurious coat is a highly memorable one, meaning we've acquired a mental log of every time we've seen it pop up on the gram (which is, to be clear, a lot). Now that we're well into the season, we have no doubt left in our minds that it's the most highly documented coat on all of Instagram. But go ahead and fact-check that if you're so inclined. The proof of the coat's dominance is all over the photo-sharing app, but we went ahead and compiled our favorite looks in the coat's many colors just below. Keep reading to see how it's worn on Instagram and then shop the coat. It comes in an array of enticing candy colors that seem to be plucked right out of a crayon box. The wonderful thing about a statement coat this like? Throw it on over sweats and sneakers and you'll still manage to look pulled together. Though the coat may be Saks Pott's most recognizable piece, the Scandinavian brand has also dreamed up some serious cult-worthy accessories like the above logo tights (another Instagram favorite) and shearling shoulder bag. Adored by models and fashion girls alike. The standout silhouette and statement fur trim may speak for themselves, but fashion girls aren't afraid to punch up the look further by adding in more dramatic accessories. The brown leather version has a retro feel to it, no? It also comes in the above patent leather finish, which just so happens to have a fresh feel for spring. Notable celebrity fans of the coat include Slick Woods, Kendall Jenner, and Cardi B, to name a few. Make like Courtney Trop and coordinate your sunglasses to your coat for a winning winter ensemble. The soft leather version may have taken center stage, but fashion girls are also fans of the coat's patterned wool iterations. I mean, is the coat not just waiting to be photographed? Speaking of Instagram trends, this pretty jewelry trend is taking it by storm.